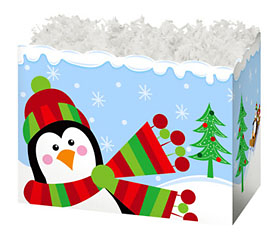 Large Snowman Gift Basket includes the listed items and is packaged in a cellophane bag tied with a beautiful bow. Comes with decorative matching gift tag attached. Have us ship this gift to a family or friend and include your message on the card! Large Gift Basket Box Dimensions: 10 1/4" x 6" x 7 1/2"